If you are looking for a quick and easy card, this is IT. 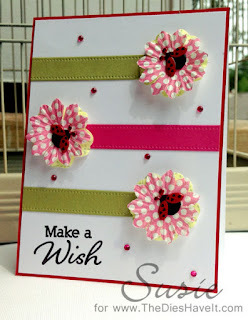 I cut three stitched strips using a die from MFT Stamps and attached them to my card front. Then I layered some flowers and brads from Eyelet Outlet over each strip. 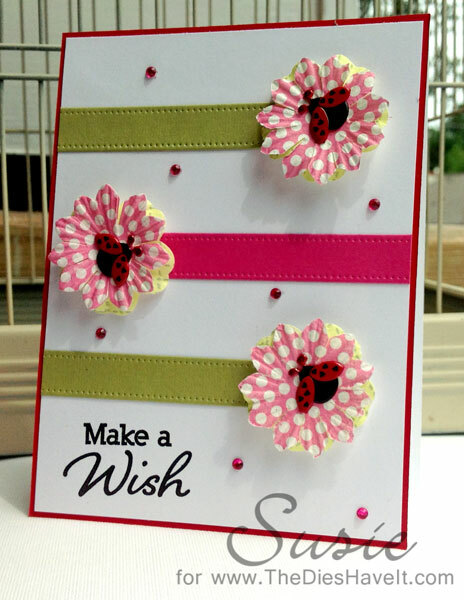 I stamped my sentiment (also from MFT Stamps) and added just a few pink gems to complete my card. E A S Y !! I am not sure how much easier it gets....so I am planning on using this card idea again (in a pinch). That's it for today. I'll see you again tomorrow. Too cute Susie, how darling!